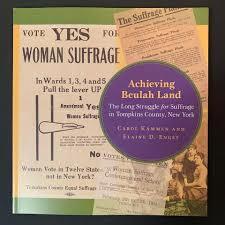 On Tuesday, April 9th Elaine Engst, Cornell University archivist (retired), and Carol Kammen, the Tompkins County Historian will present Achieving Beulah Land the history of women’s suffrage activities in Tompkins County from the 19th century to just after World War I. They have written a book by the same title. 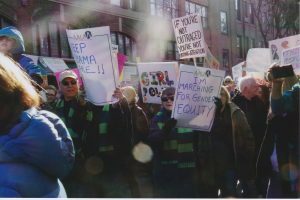 Several of the founding mothers of the Ithaca branch of AAUW played major roles in the suffrage movement here. We will cosponsor this talk with the TCPL. It will be held in the Borg Warner Room of the TCPL at 7 p.m. You will be glad you attended this program. 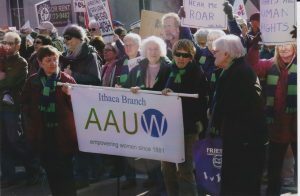 On Wednesday, May 15th we will kick off the next 99 years of women’s leadership by our branch, when we hold our May annual dinner at the Ithaca Country Club. We are excited to announce that our guest speaker for the evening will be Bevin O-Gara, the producing artistic director of the Kitchen Theatre. More information will be in next month’s newsletter, but please put it on your calendar.